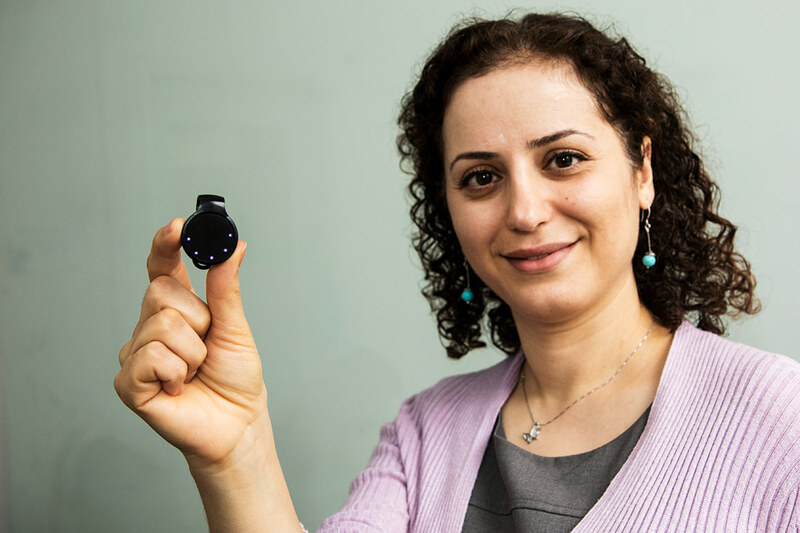 Not much bigger than a bottle cap, the device Neda Ghazi holds in her hand could have a significant impact on Canadians’ health. While the QSun can be used as a standalone wearable, the real power comes when paired with a clever smartphone app that makes use of artificial intelligence to tell users everything from how much sunscreen to apply to how much vitamin D their bodies are producing, taking into account things like skin type and clothing worn. You can even take a selfie and have the app estimate the age and health of your skin. Originally from Iran, Ghazi says she and Monam got the idea for Comfable after immigrating to Canada in pursuit of academic careers in the field of urban climate. But once in Toronto, they had a change of heart. “We wanted to translate the results of our PhD and post-doctoral research into a product,” she says. So Ghazi and Monam turned to U of T’s Impact Centre accelerator, one of the university’s nine on-campus entrepreneurship hubs. They completed the accelerator’s Techno program in 2015 and launched a portable “weather station” called the QTemp through a Kickstarter campaign the following year, selling 2,000 units. Based on the feedback received on the first device, Ghazi and Monam positioned their second product, the QSun, more of a “health tech” tool, and made it sleeker and more stylish-looking. QSun is currently being sold directly to customers. But Ghazi, who was recently named among Canada’s "Inspiring Fifty" women in the technology field, says the startup’s goal is ultimately to partner with third party distributors like travel and tourism companies or even sunscreen manufacturers. There are also plans to integrate QSun with fitness trackers made by tech giants like Apple and Google, Ghazi says.